Alejandro Sanchez uses a gas station’s pump to fill his vehicle with gas on Feb. 4, 2013, in Miami, Florida. A man pumps gas at a 76 gas station on July 16, 2013, in Los Angeles. The most lasting change in the U.S. energy landscape may not be that we’re producing more oil — but that we’re using less. Demand for oil has fallen in recent years, as Americans drive less and buy more fuel-efficient cars. 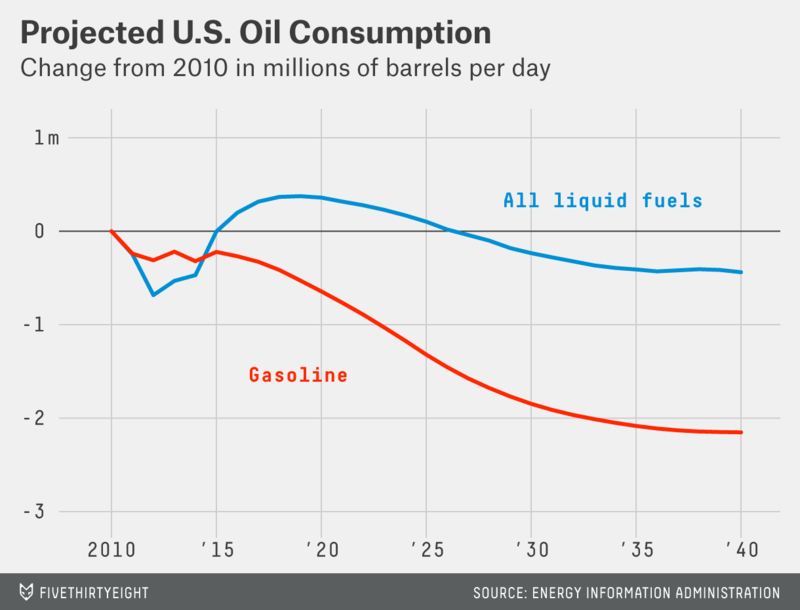 Daily consumption is down nearly 2 million barrels since 2005, a 9 percent decline. The drop is small in percentage terms, but it represents a remarkable shift, one that few people saw coming. For most of the post-World War II era, Americans burned more oil each year, a trend broken only briefly by the price shocks of the late 1970s. This time, the shift appears to be more lasting: In a new report released this week, the Energy Information Administration (EIA) said the U.S. will burn slightly less oil in 2040 than it did in 2010. Overall energy consumption per person is set to fall even more steeply, to the lowest level since 1965. Long-range forecasts are inherently uncertain, especially for commodities like energy that depend on so many variables — prices, demographics, technology and, crucially, overall economic growth. The EIA hedges against that uncertainty by publishing a range of projections based on different scenarios that assume varying levels of economic growth, regulation and driving behavior, to name a few factors. But when it comes to oil demand, the various projections turn out to be relatively consistent.1 Even in the case of the highest demand growth, the U.S. would burn only a million more barrels of oil per day in 2040, an 0.3 percent annual rate of increase. Moreover, under every single scenario, the EIA expects American drivers to burn less gasoline in 2040 than they do today. There are two major factors driving the decline in gasoline demand: Americans are driving more fuel-efficient cars, and they’re driving them less. The more surprising change is in Americans’ driving habits. For decades, Americans drove more miles each year — even the ’70s oil shocks did little more than slow the rate of growth for a few years. But “vehicle miles traveled,” a measure of total driving, fell in the latest recession and has been roughly flat ever since. On a per capita basis, driving has fallen steadily since 2005 and is now at its lowest level since the mid-1990s. The slowdown in driving is partly a reflection of the lackluster economic recovery. People tend to drive less during recessions, both to save money and because people without jobs don’t need to drive to work. But the economy alone can’t explain the recent pattern in driving, the EIA says. Demographics are also a factor. The aging of the baby boom generation means that more Americans are entering their retirement years, when they tend to drive less.3 At the same time, young people are driving less, likely due to the rise of telecommuting and online shopping and, to some degree, the increasing popularity of urban living. This mix of factors makes the long-term future of American driving hard to predict. Under one EIA scenario, driving rebounds, with total vehicle miles traveled rising 1.1 percent per year in coming decades. Under another scenario, driving hardly picks up at all, and falls on a per capita basis. But because of the gains in fuel efficiency, total gasoline consumption falls under either scenario. And yet oil will maintain its dominance. The EIA forecasts only a modest role for renewable energy in its baseline scenario. Even under alternative scenarios in which Congress imposes a tax on carbon emissions, renewables do little to offset oil demand, although they play a larger role in electricity generation. The EIA does see some role for natural gas as a transportation fuel, mostly in trains and heavy-duty trucks, but estimates it will account for only 3 percent of total transportation energy consumption in 2040. Nonetheless, decreased demand for oil will have significant environmental benefits. The EIA sees per capita carbon emissions declining 12.5 percent by 2040. The decline in U.S. oil demand has gotten relatively little attention in recent years, in part because of the far more rapid increase in domestic oil production. That boom has indeed been remarkable. In a mere five years, the U.S. has reversed nearly three decades of production declines — declines virtually all energy experts considered permanent just a few years ago. The EIA now says production will near its all-time peak within the next few years and may even exceed it. But the oil boom’s longer-term prospects are far from certain. The EIA expects production to level off after 2016 and to begin to fall after 2020. In the short-term, production rises under all of the EIA’s main scenarios, but from there the projections diverge sharply. Under the most optimistic projection, daily oil production rises by 1.8 million barrels from 2020 to 2040; under the most pessimistic, it falls by 2.2 million barrels. Even if the oil production boom continues, the plateauing of demand may prove just as significant, if not more so, simply because in a global context U.S. demand matters more than its supply. Americans use 20 percent of the world’s oil and produce just 12 percent of it; even under the most optimistic production scenarios, the U.S. won’t account for more than 16 percent of global oil production in coming decades. Unless the U.S. cuts back its share of consumption, it will remain reliant on foreign sources of oil — sources that are looking both more uncertain and more expensive as the age of “easy oil” comes to a close. The EIA’s forecasts come in for frequent criticism from people across the energy spectrum. But the agency is refreshingly transparent about its assumptions and the uncertainty surrounding them. The outlook includes dozens of different scenarios, and the EIA has published an online tool that allows users to compare them. All figures include cars and light trucks. More older Americans are driving than in the past, and they’re driving more miles than ever. But people over 65 are still less likely to drive, and drive less on average, than people in their prime working years.